On the occasion of January Haute Couture week, held in Paris, CHANEL unveiled a new and iconic High Jewellery collection, inspired to the quilted pattern motif: “Signature de CHANEL”. “Signature de Nacre” cuff in 18K white gold set with 496 brilliant-cut diamonds for a total weight of 20.3 carats and carved mother-of-pearl. “Signature de Nacre” ring in 18K white gold set with 95 brilliant-cut diamonds for a total weight of 1.4 carat and carved mother-of-pearl. “Signature Duo” ring in 18K white gold set with 158 brilliant-cut diamonds for a total weight of 2.6 carats. Forty-eight new jewels designed by the CHANEL Fine Jewellery Creative Studio that are a variation on the quilted pattern and pay tribute to that inspiration. Graphic and refined, they express the purity of line and the perfection in simplicity that characterise the style of CHANEL. Curves and volumes that give life to multiple combinations and transform each piece of jewellery into a tactile material that, in its fluidity, follows the body’s every movement in a sensual embrace. The quilting is then the main protagonist, with its curved lines highlighted by the delicacy of its diamond-paved contours. “Signature d’Or” ring in 18K yellow gold set with 168 brilliant-cut diamonds for a total weight of 3 carats. 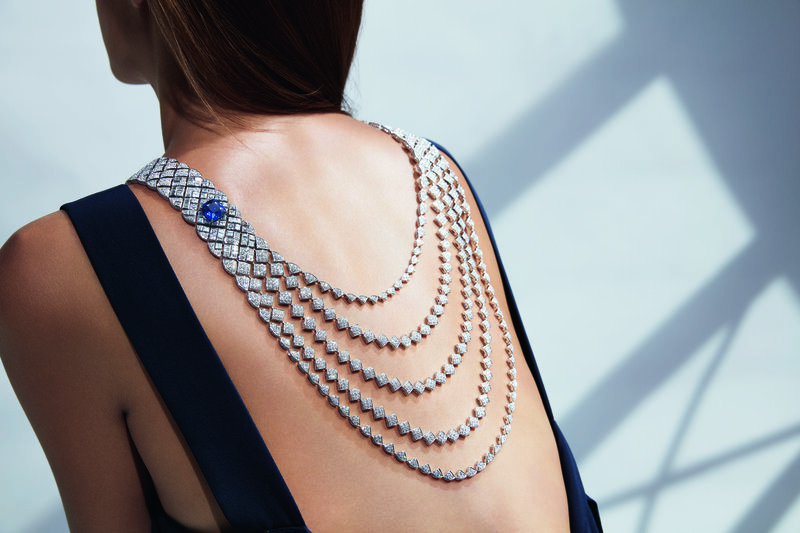 Or, in other instances, it is gracefully accompanied by azure blue sapphires and aquamarines, or by pearls, grey mother-of-pearl marquetry and rock crystal: all adding contrasting touches and luminous brightness to the white gold and diamond main theme. weight of 12.4 carats and 308 Japanese cultured pearls. weight of 20.3 carats and carved mother-of-pearl. total weight of 7.7 carats. “Signature Cocoon” earrings in 18K white gold set with 251 brilliant-cut diamonds for a total weight of 3 carats and carved rock crystal. “Signature Acidulée” ring in 18K white gold set with a 23-carat cabochon-cut aquamarine and 216 brilliant-cut diamonds for a total weight of 2.1 carats. Post by Claudia Carletti, Jewellery Through Time. Material courtesy of Chanel Press Office.